It took me a few pages to get use to Iwamoto's artwork. I can say that it's a very nice tankobon. I KNOW YOU WANT MY MONEY UDON. HURRY UP AND LOCALIZE THIS SO YOU CAN HAVE IT. inb4 people start bitching about legends on this post. Tanjou would pick it up, but it's likely Udon will do something about it. Besides they're more for the Classic series. I just wanna know what the story is for the Manga I have owned for soooo long. I second that motion. I'd really appreciate it if you guys start to filter some of these worthless (inb4 and other like comments that just reflect poorly on our community. Please let this mean UDON takes notice of demand and localizes this. Because once they do, I'm throwing all my cash to them. I'd buy MegaMix, GigaMix, and THIS, all in one swoop. Legends bitchin' in a manga post, nice. That makes me wonder, how come Legends never got a manga version? Oh well. As for these books... they look amazing. I'm not a fan of the art style, but oh my god, if UDON releases these 5 motherfuckers, I'll totally buy them. Did the manga stop after the 4th game, or these numbers are for something else? I might just buy the Ariga books while waiting for UDONs answer. Ariga's artwork is amazing. UDON is awesome. Best combo ever, hands down. Do they plan on releasing that boxset japan had? That thing looked pretty awesome. I love manga boxsets and omnibus editions. I doubt UDON will do it, especially considering that these are majorly limited edition. It'd be nice yes, but I doubt it. I have these books from the 2005 printing, and they are very nice. If you only get one, get X4. All the others have the same material that was in the standard small format collections. 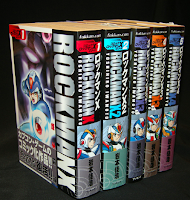 The final volume of X4 in the small format was never released, so the story just ends without any resolution. The big book is the only format outside the original printing in the monthlies that has the entire thing. There were manga released for the later X games, but they were four panel gag comic collections and not cohesive stories. 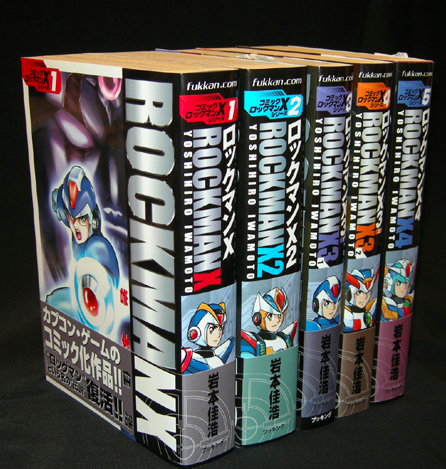 The X7 manga is the easiest to find. The others are petty rare. I'm not sure if there was one for X8. X7 manga???? Where? WHERE??!!!! I MUST HAVE IT! Oh, and I want all of Iwamoto's X manga too. C'mon, Udon, do your thing! the problem with udon is that they think the artwork is too "retro" in the x manga's, and that was the reason they gave on the megaman network forums for not bothering with translating the x mangas. what a pathetic reason for not wanting to release them in english. i'd love to see these released in the us someday so I can actually understand whats going on, I still have my original editions released back in the 90's. but with udon, I wouldn't hold my breath for a english release unless the fans constantly email them about it. so i'm just curious, how would someone in the us go about ordering these books from japan? I want to see that manga released in english as much as you do, but that's a perfectly good a logical reason. as much as I like Iwamoto's style, it IS pretty retro, and that tends to not fly well with this generation, and they CAN'T depend only on sales from fans, because it's just not enough for profit, sadly. @ Anon below my last post.. I have an extra copy of the X7 koma I'd be willing to sell. If you're interested, email me at kobun37 at yahoo dot com and we'll work out the details.